The undisputed hot-spot of the Aegean Coast, Bodrum is a swinging, singing, dancing town and its bohemian atmosphere gathers together Turkey's artists, intellectuals and lovers of the good life. An impressive medieval castle built by the Knights of Rhodes guards the entrance to Bodrum's dazzling blue bay, in which the Aegean and the Mediterranean Seas meet. The Castle of St Peter (Bodrum Castle) now houses the Museum of Underwater Archaeology. Marmaris Bay resembles a calm lake and offers ideal mooring for yachts. The Marmaris Netsel Marina, one of the largest and best-equipped in Turkey, and the Marmaris Albatros Marina, one of the best for wintering and maintaining yachts, make Marmaris an excellent starting point for the Blue Voyage tour of the Aegean Coast. 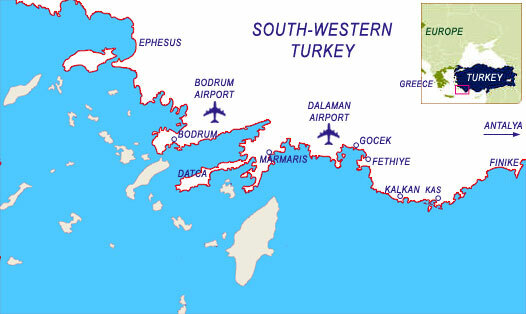 Delikli Island lies right off the coast, southeast of Ekincik. Dalyan Delta, has a long, golden, sandy beach at its mouth and is a nature conservation area and a refuge for sea turtles (caretta caretta) and blue crabs. At a bend in the river, high on the cliff-face above the fascinating ancient harbour-city of Caunos, magnificent tombs were carved into the rocks. Sailing southeast from Delikli Island, the next destination is Sarigerme. The Gulf of Gocek is one of the Mediterranean's best sailing spots. Dotted with islands and indented with many coves, its land and seascapes are irresistible. The ruins of Arymaxa, an ancient city at the southern tip of the gulf, lie at the edge of the azure waters. Opposite on Tersane Island stand Byzantine ruins, including those of the ancient shipyards. The resort town of Fethiye has an important marina and overlooks a beautiful bay strewn with islands, and has great historical interest with Lycian rock tombs cut into the cliff face, reproducing the facades of ancient buildings. Belcegiz Bay and Oludeniz are interesting to explore, where the calm, crystal-clear waters are ideal for swimming, diving and other water sports. On Gemiler Island, Byzantine ruins lie tucked among the pines. 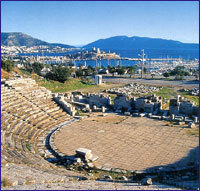 An ancient theatre on the long Kas Peninsula is within walking distance of the town. The island of Kekova is a one hour sail from Dalyanagzi (ancient Andriace), and there are many more picturesque islands with numerous bays and ancient cities. These bays provide natural harbours throughout the year. Along the northern shore of Kekova Island, at Apollonia, earthquakes once disturbed the land causing some of the ancient houses to sink under the clear water and creating a sunken city. Demre (Kale) is the site of ancient Myra, 25 km west of Finike, with many interesting carved rock tombs overlooking the magnificent Roman theatre. St Nicholas (better known around the world as Santa Claus) was the bishop of this Mediterranean city during the 4th century and died here. The fully equipped Park Kemer Marina has facilities for all activities and you can enjoy the unspoiled bays and beaches south of the town.